The military convoy through the desert is such a laugh. It is full of frustrations but I wouldn't want to miss it. 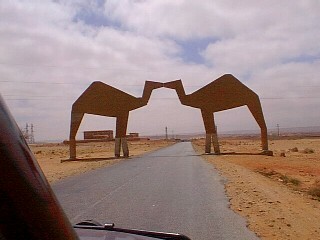 Continuing on our journey south one crosses the Tropic of Cancer and enters the area known to us as Western Sahara. There is no official border and is debated territory. Once the Spanish left the area Morocco, Mauritania and Algeria all made a claim. It is generally considered to belong to Morocco and is populated sparsely by Moroccans. It is impossible to buy Michelin maps (of Morocco) in Morocco - they are banned because they show a border. In an attempt to encourage people to move south (hence enhance Moroccan ownership of the land) the area is tax free and diesel can be bought for around 20p per litre. There is a high military presence and the route is punctuated by stops at military checkpoints where passports are checked and details recorded. It is inconvenient but no hassle is involved. 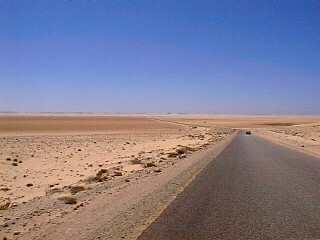 The landscape gradually becomes more like desert with dunes appearing. Occasionally dunes try to creep across the road and are sometimes successful in forcing us off the road to go around them. 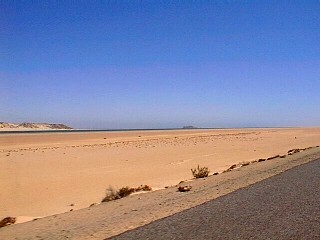 The road south towards Dakhla follows the coast for around 600 km and although it seems to go on for ages it is quite interesting in a boring sort of way. It just goes on and on. A common sight is leaning Land Rovers that look as though they are crabbing and coming right for you. The amount of baggage that people carry on roofs is incredible. Punda continues to go really well. The mpg value is slowly climbing. The record so far is 26.9 which is not bad for the weight. 70mph is now easy whereas it used to be a struggle. Overtaking is easy too  we just shout "Power to the Punda" and off she goes whizzing past all that is in the way (Ferrari, Jaguar, 2CV). 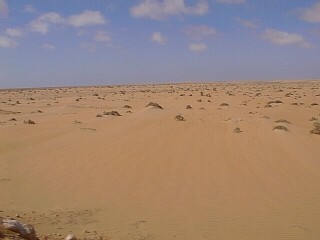 The campsite at Dakhla looks as if it is meant to keep the campers in rather than the locals out. As well as the soldiers the town is buzzing with UN personnel in their brand new Land Cruisers. They use the best hotels too. I wouldnt mind working for them. To go south into Mauritania across the unofficial land border one has to join a military convoy which departs twice a week. We expected the formalities (gendarmerie, police & customs) to take all day but it took less time than getting £20 out of the bank. With the formalities done we set to work on the chores  fix the diesel leak; the broken speaker; the broken headlight cover; the tent connections. The accounts needed doing along with washing and preparation of paperwork for Mauritania. We were up early on the 11th, excited because the convoy was due to leave at 9am. As we were having breakfast a small pickup arrived at the campsite with a camel in the back. We were laughing as it was looking around as if it was normal for a camel to be a passenger. The Moroccans assisted it out of the truck by the toilets and within minutes had cut its throat, skinned it and chopped it up. I have never felt so sick in my life. It was the stuff that nightmares are made of and the vision and sounds are still with me. Andrew continued to eat his jam sandwiches while he watched as I was near to throwing up in the back of the car. I cannot believe they did that in a campsite. Fortunately we had the convoy to distract us but throughout the day I found it difficult to look at a camel because all I could see was the mess at the campsite. Camels are fabulous animals. They have such character and are so aloof that I just cant help but like them. What a fantastic experience the convoy was. 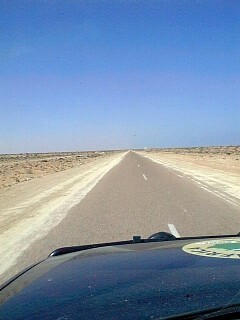 It is worth going to Mauritania just for this adventure. There are so many stories I could write a book. There is a threat of bandit attacks between Dakhla and Nouhadibou (Mauritania) because of the lack of ownership of the land. Consequently all vehicles going south are escorted by the military. The border between Morocco and Mauritania is officially closed but there is a massive trade in 2nd hand Peugeot and Mercedes from Europe which is a sufficient financial incentive to allow vehicles through. Our convoy consisted of about 15 vehicles: us (the only Brits), Harry & Mariam (German) in a 4x4 camping truck (splendid), Joel & Nadine (French) in their Peugeot which they are selling in Mali, Wolfgang (mad German) in his Mercedes, Olivier (French guy selling his car in Mauritania), the French truckers (3 trucks + 2 cars) on an aid mission to Burkina, some French in a Nissan, Michael (American) & Mica (Japanese) hitching ... and the Mauritanians. The latter had three old series Land Rovers and one new Mercedes from Europe. The Land Rovers were so battered and had so much luggage on top that they were almost twice the original height. Already overloaded about 6 people then got inside each one! 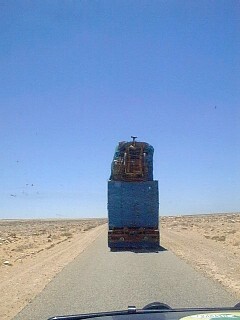 By now it was 2.30pm and we set off in three groups  the Mauritanians first, then the truckers then the remainder in cars. We had barely gone 30 km when we passed the first of the Land Rovers  on its side! After an hours travelling we stopped for two hours while the luggage and people from Land Rover 1 were reallocated to Land Rovers 2 and 3. Two hours later we stopped again for an hour while we waited for the seriously laden Land Rovers to catch up. We then drove for 10 minutes to the camping area on the side of the road. Common sense is an unknown phenomenon in this place! In the morning we said goodbye to our Moroccan escorts as we joined the 37 km piste through the minefield to Nouhadibou. Didn't try out any of the local food! It takes a strong person to withstand some of the goings-on at the campsite in Dakhlar.